Columnar-lined Barrett’s esophagus (BE) requires endoscopic surveillance for risk of adenocarcinoma. 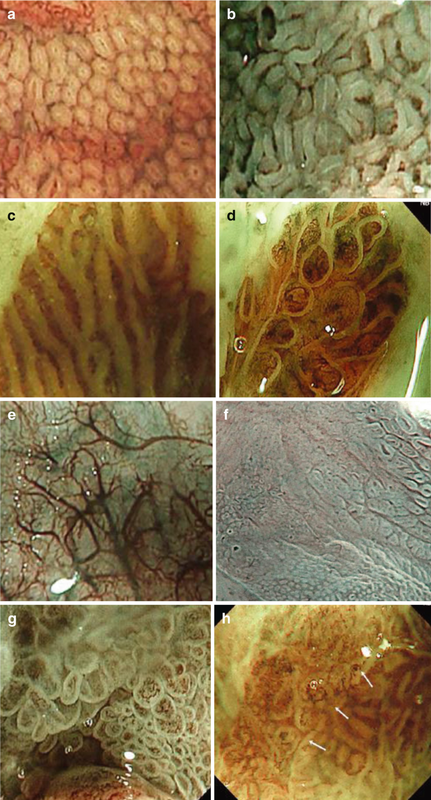 A course of proton pump inhibitor pretreatment reduces inflammatory changes and facilitates endoscopic recognition and histologic diagnosis of dysplasia. Detection of HGIN or early cancer (T1 m) demands close inspection for any irregularities, which must then be analyzed on magnifying endoscopy. The degree of invasiveness of early cancer is predictable from macroscopic type, alteration of microvascular architecture on magnifying narrow-band imaging (NBI), and irregularity of surface structure on acetic acid chromoendoscopy. Endoscopic resection with curative intention by EMR or ESD can be offered for HGIN or noninvasive or microinvasive mucosal carcinoma, when free margins (R0) are achieved on well-differentiated or moderately differentiated superficial adenocarcinoma (category T1 m or T1b-sm1) without lymphovascular invasion. However, cancer with deeper submucosal invasion (T1b-sm2-3), lymphovascular invasion, or poor differentiation (G3) should undergo surgical esophagectomy for cure. We gratefully acknowledge the contribution of ESD cases by Dr. Tsuneo Oyama, Nagano, Japan; Dr. Hans P. Allgaier, Freiburg and Dr. Micheal Anzinger, Munich, Germany; and Dr. Frieder Berr and Dr. Daniel Neureiter, Salzburg, Austria. The morphology of surface and vascular patterns of Barrett’s epithelium and BE neoplasias have been analyzed by Kara , Goda [23, 24], Anagnostopoulos , Sharma [16, 17], and others. 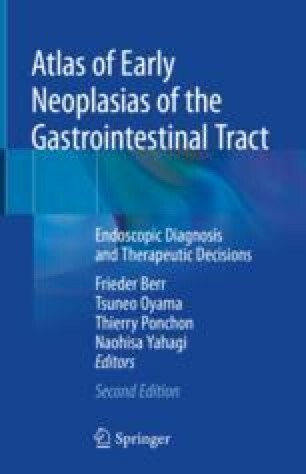 The Nottingham classification supplemented with Goda’s VP types (Table 8.2) tries to define whether Barrett cancer is superficial and an appropriate indication for endoscopic resection, or if it shows signs of deep sm invasion, an indication for esophagectomy [22, 23, 24]. (See Table 8.2 and Fig. 8.18.) Capillary (VP) and surface relief architecture (SP) of BE-AC bear analogies to early gastric cancer, but have not been prospectively validated for BE-AC.